The main interest of our team lies in understanding the regulation, organization and dynamics of acto-myosin contractile networks. We are particularly interested in the contractile ring that functions during cytokinesis to partition the contents of the mother cell into the two daughter cells. During cytokinesis a contractile ring assembles around the cell equator beneath the plasma membrane after the replicated chromosomes have segregated. Constriction of the ring draws the plasma membrane inwards, closing the gap between the two daughter cells. One of our goals is to dissect the molecular mechanisms of ring assembly and constriction. 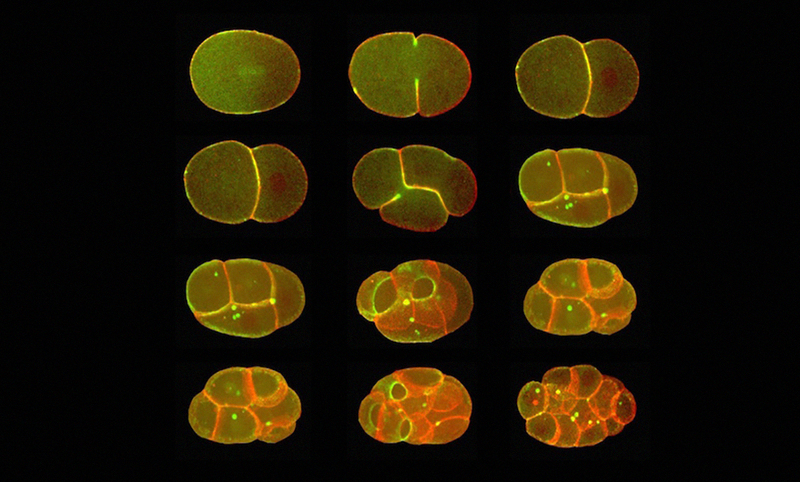 To do this, we study early embryonic cell divisions in the nematode C. elegans, as actin, myosins and most of their regulators are well conserved in this system. Our favorite experimental approaches include live cell microscopy, genome engineering for generation of transgenic worms and structure-function studies, genetics and biochemistry. Using some of these approaches, we recently uncovered a robust gap repair mechanism in the contractile ring that ensures timely completion of cytokinesis (Silva et al., 2016). Gaining mechanistic insight into the process of cytokinesis is of significance for the understanding of tumorigenesis as failure of cytokinesis gives rise to polyploid cells, which have been postulated to be critical intermediates in the development of cancer. In addition, lessons learned about the contractile ring will help us understand other essential cellular processes that utilize acto-myosin contractile networks, namely tissue morphogenesis, wound healing, cell migration, and cell invasion. Work in our lab is funded by the European Research Council and FCT.